Something big is going on this weekend at Elbo Room. I have previously mentioned the fantastic work that's being done by the Chicago Roots Collective, which is bringing Chicago musicians and fans together in a collaborative environment. This weekend will mark the collective's largest event so far in the form of the first ever CRC Festival, and will offer some serious bang for your buck with over 75 Chicago musicians taking the stage. 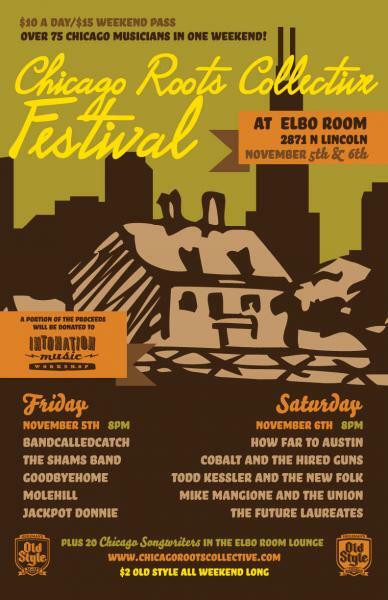 Showcases on both Friday and Saturday night at Elbo Room will feature full bands performing downstairs and singer-songwriters playing upstairs. 21 and over, 8 p.m.
Read on to check out the lineup and all other information you'll need to get acquainted with this great local event. All t-shirt sales from the weekend will go directly to The Intonation Music Workshop, a Chicago non-profit organization that hosts after school music programs to the youth. yeah Chicago!!!!! this is gonna be so much fun!